High Quality Content by WIKIPEDIA articles! High Quality Content by WIKIPEDIA articles! 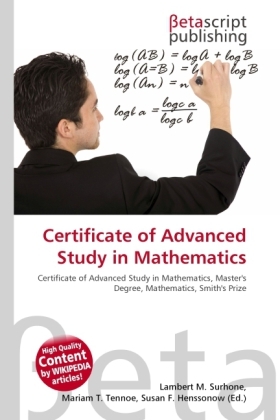 The Certificate of Advanced Studies in Mathematics (also CASM or Part III) is a one year Masters-level taught course in mathematics offered at the Faculty of Mathematics, University of Cambridge currently taken by over 200 students each year. Roughly one third of the students take the course as a fourth year of mathematical study at Cambridge, whilst the remaining two thirds take the course as a one year course. The course lasts one year, divided into three eight-week terms. There are a wide variety of lectures on both pure and applied maths, mostly concentrated in the first two terms. The third term is primarily for examinations (and revision for said examinations) which, together with the option of writing a part III essay (introduced in the 1970s, a miniature thesis of sorts, often in the form of a literature review), determine one's final grade entirely.